The communicating touchscreen thermostat is the HVAC command center of the system including a heating unit, that can be the Chinook gas furnace or the Supreme electric furnace, in combination with our Alize heatpump. All these devices are linked together and communicate using ClimateTalk language protocol. 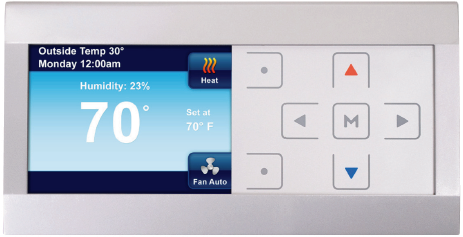 The modulating thermostat enables to modulate the heating unit but not the cooling unit. This allows to use a 2 Stage legacy outdoor cooling unit.